Enter your dates to pick from 251 hotels and other places to stay! Muri Beach Hideway offers a tropical island escape, with a variety of self-contained accommodations options. Location Location Location....Walking distant to many activities and restaurants also excellent customer service. Located directly on the beachfront, Sunrise Beach Bungalows is set on 1 acre of gardens and beach. It offers a swimming pool and free tropical breakfast on your first morning. Caryn is awesome! Got an upgrade to the new Seaview bungalow - which is beyond amazing! Love the location, the pool was great also! Set in tropical grounds, Kia Orana Villas is located in Atupa village in Rarotonga. Guests have access to a salt water swimming pool and 3 spa pools. Free private parking is available on site. Everything else was wonderful!! Located in the wonderful village of Nikao, this property features studios and villa with private balconies and offering beautiful sea views, Each room has its own private BBQ facility and outdoor... Everything! Albie & Gurlie were such wonderful hosts, the place itself was just great in every way. We had everything we needed for our 2 week stay. Stargazing was phenomenal. Having our own kayaks to use as well as lounge chairs on the deck and table & chairs was perfect. 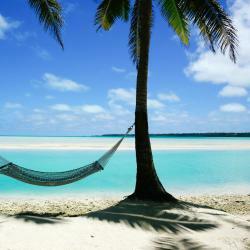 Hammock - sighhh. Much quieter and sunnier than the tourist thick Muri side, and best of all were the sunrise AND sunsets over the water (neither of which you get on the Muri side). I’d come here and only here again and again! Boasting an outdoor pool and stunning, tropical garden views, Muri Retreat Apartments is just a 4-minute drive from Manea Beach. Steve and Phoebe were so wonderful, very personable and helpful. We loved our apartment and really want to go back! Kitchenette had all the amenities you need. Beautiful gardens, pool, deck. It was perfect! Boasting a beachfront location, Muri Shores is located in the heart of Muri town center and is made up of 4 absolute beach-front villas and 2 air conditioned lagoon view villas only a few steps away... 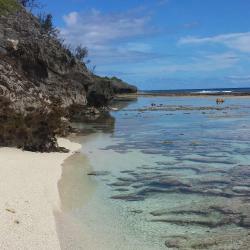 This must be one of the best locations in Muri and in Rarotonga. What could be better than your own villa right on the beach with just a few steps to the sea? Contact with our host Kyrstina was easy and she couldn't have been more helpful. Boasting beautiful lagoon views from your private patio, Avana Waterfront Apartments offers guests private beach access and lovely tropical gardens. Stunningly beautiful location, friendly hosts, free kayaks, comfortable rooms - what's not to love. Being close to Muri beach and on the lagoon is definitely the place to be. Easy kayaking and swimming off the pier each day. Lots of fish to see. Easy drive to anywhere else on the island for snorkeling or other eats - though great options nearby too. Overlooking Aroa Beach, Lagoon Breeze Villas offer a private balcony with ocean, mountain or garden views. Immacultely clean and tidy. lovely and quiet and private. good breakfasts and friendly staff. 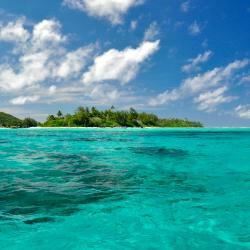 Offering direct access to Muri Beach, Muri Beachcomber is just 5 minutes’ walk from Rarotonga Sailing Club. Guests enjoy free use of kayaks, paddle boards, snorkeling equipment and BBQ facilities. To travel from so far , my wife & I have/had many expectations. MURI BEACHCOMBER promised every good thing & delivered more. The Airport pick up & drop off sealed the deal. Thank you, "CARIBBEAN AL"
Magic Reef Resort offers Polynesian-style bungalows in a great location right on the beach in Rarotonga. This little resort offers spacious accommodations with great ocean views. Absolutely amazing stay! The west coast is definitely the best place to stay, with less wind and sensational sunsets. We would sit and watch the whales swim by--that was spectacular!! Gillian and Amy were both great to work with, exceptionally helpful, they went out of their way to help every one of their guests, give advice, even baked a birthday cake for one of the guests! Location was great, right on the beach, lots of restaurants withing walking distance, town was a short ride. The first day breakfast lasted us 3 days, fantastic fruit, bread, jam. juice, and great coffee also. All of the fellow-guests were great to visit with; everyone would meet by the beach around sunset and visit and watch whales. The room was perfect, the kitchenette included all the dishes, gadgets, and pots/pans you'd need, a stovetop, and refrigerator; there was a microwave available on the property. I loved the wood-carved bed, front wall, and tables, they were works of art in themselves. The bed was comfortable, everything was really clean, and the shower outside was great. Featuring a garden, an outdoor pool and sea views, Abera's Aitutaki Villas is located in Arutanga. With mountain views, this property provides a balcony. The place was sparkling clean, the hosts were amazing! The silence, the “private” beach in front of the room, the fresh fruits... everything was just perfect! Would definitely come back and recommend this place to our friends! 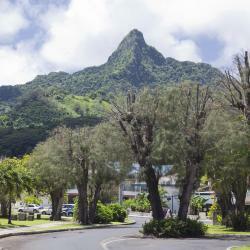 Located in Rarotonga, Rarotonga GolfSeaView has accommodations with seating area. Wonderful friendly hosts who are always willing to help to make your stay in their beautiful accommodation worthwhile. We loved everything about this property to the 2bdrm apartment and the studio. They all have balconies which have stunning sea views. Everything you could possibly need is in this property. The pool which was beautifully clean was just enough to cool you down during the hot weather. A big THANK you to our wonderful hosts!! Set in Avarua, Te Manga Retreat has an outdoor swimming pool and gardens. Among the various facilities of this property are verandas, a shared lounge and indoor and outdoor dining areas. Lynn and Stuff are great hosts very welcoming hosts. Thank you for having me stay in your beautiful home. The place is close to everything you need in town only a short walk. 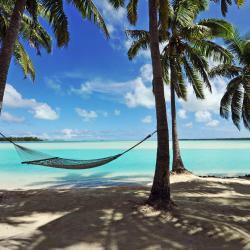 Located in Arutanga in the Aitutaki region, Tavake Villa has a balcony. Guests staying at this villa can use the fully equipped kitchen. Outstanding, friendly host! Greeted us at airport, took us to house, checked in with us to make sure everything was fine. Ti is opening take out next to property and served us the most amazingly delicious hamburger! What a cook! Also arranged last minute car hire for us when we were unsuccessful on line. If you like staying in private home instead of big resort, this is perfect! Waterfront, in neighborhood surrounded by local families, yet very quiet. Has air conditioning and washing machine which is nice for those who have been traveling for awhile like we had. Don’t miss the lagoon cruise! Absolutely stunning and fun! We wish him the best. 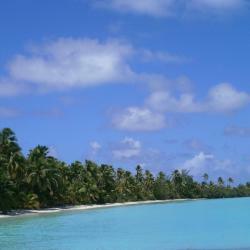 Turama Beach Bungalow is located in Rarotonga and offers a private beach area and a garden. This beachfront property has a terrace. Don’t know why other reviewers are stuck on the proximity of the house to the road... y’all, REALLY! Those porches and the focus of the house to the ocean a few short meters aways is fantastic. The only sound I heard was that of the ocean and the wind in the trees. This was not my 1st time or last on Raro. This is now my GO TO landing spot for Raro layovers and stays! Mahalo nui loa/ Metaki ma’ata, Penina, for your hospitality.